In 2013, “Illumination: Tree Lights at The Morton Arboretum” was born from a simple idea: To see trees in a different light. Instead of treating trees as armaments for decorative lights, “Illumination” uses light to reveal the beauty of the trees themselves. Four seasons and hundreds of thousands of guests later, the award-winning show continues to surprise and delight guests with new experiences. This season’s highlights include Treemagination, where a grove of hemlock trees is animated with project-mapped images, and Fantasy Forest, a magical light show set to an original score. 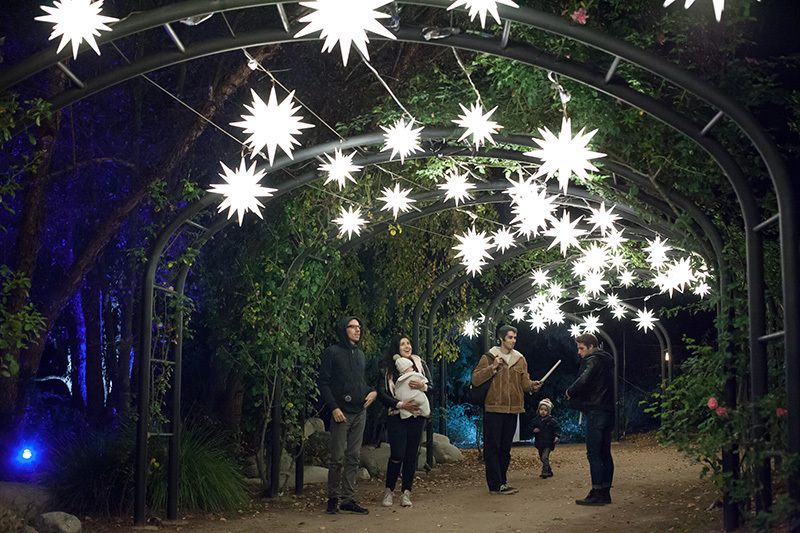 This holiday season also marked the debut of an all-new winter lighting experience, “Enchanted: Forest of Light” at Descanso Gardens in La Cañada Flintridge, CA. Conceptually inspired by “Illumination”, “Enchanted: Forest of Light” is as unique and different from “Illumination” as the two gardens are from each other. The installation immerses guests in the beauty of this 150-acre botanical garden through expressive, artistic and abstract visual and media displays that blend light, sound and music. Highlights include Symphony of Oaks, where guests paint an interactive sonic and visual landscape across a majestic grove of coastal live oaks and Luminous Lawn, where an immersive art installation by interactive light artist Jen Lewin brings whimsy and play to a pair of forest clearings, engaging children and adults alike. Two unique projects on opposite sides of the country, both “Illumination” and “Enchanted: Forest of Light” bring light and wonder to the holiday season, and both examples of focused, bespoke lighting and visual design by Lightswitch.